Turn APE to WAV audio files online and without registration! 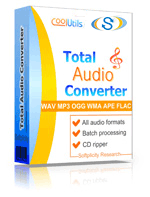 Try a APE to WAV Online Converter or get a batch Tool and save time! Description APE audio format (also referred to as the Monkey's audio format) is a popular lossless compression format supported by various Windows-based media players. APE achieves high quality with a 50% file size reduction compared to many popular lossy formats. Meanwhile, this format allows you to create excellent copies of your CD tracks with zero detriment to sound quality. As to the downsides of this format, it poses difficulty encoding because it uses a CPU-intensive compression pattern. Another shortcoming is that it is platform-dependent and works on Windows only.